As an historian and archivist, I’m excited by few things as much as the discovery, restoration, and revival of a movie serial long thought lost. In 50 years of actively researching and championing the preservation of chapter plays I’ve been privileged to be part of several such recovery efforts. So it was with particular enthusiasm that I visited Astoria, New York’s Museum of the Moving Image this past Sunday to see the first public exhibition in America of Pearl White’s The House of Hate since its theatrical release in the spring of 1918. For many years the serial-fan cognoscenti knew that the Russian film archive Gosfilmofond held film elements to House of Hate, which was released in Eastern Europe, Russia, and the Ukraine in 1919 following the Great War. The existing material was said to be incomplete, but I still hoped to see it one day: Where silent serials are concerned you take what you can get, since so few survive in their complete, domestic-release versions. Happily, what I saw on Sunday—a feature version running approximately three hours at sound speed—retained practically all of House‘s action highlights, including 15 of the 19 “cliffhanger” endings. I was able to confirm this by re-reading the chapter synopses printed in the serial’s pressbook, a copy of which I own. Stripped of side intrigues designed to pad the serial to 20 episodes, House‘s plot is simple. Winthrop Waldon (played by J. H. Gilmour), scion of a distinguished American family with roots dating back to the 16th century, manages the Waldon War Works, a huge munitions plant currently occupied not only with supplying ordnance to the Allies but also with developing experimental weapons that could shorten the war. As Chapter One opens, he receives a threatening note from an enigmatic enemy whose identity he seems to know. Believing his life in imminent danger, Winthrop calls a meeting of his relatives: daughter Pearl (White), brother Ezra (Paul Clerget), nephew Haynes (John Webb Dillion), and niece Naomi (Peggy Shaynor). He wants to settle the matter of inheritance and hopes Pearl will marry Haynes. But the strong-willed girl balks at this proposal; she already loves Harvey Gresham (Antonio Moreno), a brilliant scientist who works for the War Works and has a private laboratory in Waldonclyffe, the castle-like ancestral home that overlooks the plant from a high bluff. That night, Winthrop is murdered by a hooded and black-robed figure. The Hooded Terror, as he is called, has sworn vengeance against Winthrop and his heir, which puts Pearl in his crosshairs. As the serial progresses he makes countless attempts on her life. Who is this fantastical character with the strength of a madman? Well, Chapter One’s scenario points the finger of suspicion at uncle Ezra and cousin Haynes, and the next few episodes introduce a few minor suspects who are quickly disqualified. The penultimate installment reveals that scenarist Bertram Millhouser, adapting an original story by Arthur B. Reeve and Charles A. Logue, has been stringing us along. The Terror turns out to be Randolph Waldon, Winthrop’s criminally insane brother, who as a young man was shipped to Java lest his perfidy be discovered and bring shame upon the House of Waldon. It’s always a cheat to expose a serial’s mystery villain as someone the audience has never seen before; that renders the guessing game pointless. But House of Hate is so much fun that, frankly, it hardly matters that we’ve been led down the proverbial primrose path. Of Pearl White’s 11 serials—all released by Pathé—only the last, Plunder (1923), survives complete in its original domestic-release version. So it’s difficult to evaluate her output objectively. Her first chapter play, the iconic Perils of Pauline (1914), has been unfairly judged based on the only surviving material, a nine-chapter French abridgment that reordered some major sequences and totally jettisoned others, while eliminating more than half the total footage. To make things worse, the condensed version sports crudely written subtitles translated from French back into English by someone lacking any knowledge of American idiom. For decades now, appraisals of Pauline have been tainted by exposure to this bastardized edition (which, on top of its other faults, suffers from poor pictorial quality as a result of duping from substandard film elements). The House of Hate we saw had been “bumped up” from a VHS copy with innumerable dropouts. It was transferred from material cobbled together from at least two and perhaps three sources (we were told before the screening that Gosfilmofund had access to multiple prints of the serial, none of them complete) of varying print quality. But a true film buff learns quickly how to look past such defects and visualize the film as it would have appeared to original audiences. On that basis I was utterly captivated by House of Hate from first frame to last. Pearl White in her serials was often a distressed damsel, but never a passive one. She could throw a punch with the best of ’em and frequently engaged in close-quarters, hand-to-hand combat with male adversaries. In House of Hate she tangles with the Hooded Terror at least as often as Antonio Moreno does. In one scene the Terror throws her through a window; in another he pitches her down a flight of stairs. He chokes her several times and menaces her with knives, clubs, and even a fire axe. But Pearl never shrinks from a tussle with the Terror. The condensed feature version leaps from fight to chase, and from chase to cliffhanger, with dizzying speed. The action is paced so fast and cut so tight that, at 24 fps, many of the thrills were almost lost on the Museum audience. But I daresay that few of those in attendance at Sunday’s screening ever enjoyed a faster, more exhilarating three hours at the movies. I’m one of the few with an interest in serials that goes beyond the image on the screen. Having done a great deal of research on Pathé’s chaptered product I naturally looked for certain things associated with the company’s East Coast chapter plays. For example, the interior of Pathé’s Jersey City studio on Congress Street doubled for part of the Waldon War Works plant; the giveaway was the visibility in long shots of greenhouse-style windows in the sloped roof permitting sunlight to reach the stage below. Another easily spotted landmark was the Congress Pharmacy just across the street from the studio. It had the closest phone booth and therefore was invariably used for scenes in which players had to make quick calls. The Pharmacy phone booth popped up at least four times in the three-hour feature version. I’ve not yet identified the stone mansion that doubled for Waldonclyffe, but it’s also prominent in several chapters of Pathé’s Mystery of the Double Cross, shot the previous year around Jersey City and Fort Lee. Definitely not an exterior set, it likely was a private estate built during the Gilded Age by some robber baron. The New Jersey Palisades, wooded cliffs overlooking the Hudson River’s western edge, were employed for many exteriors, including a breathtaking struggle between Pearl and the Terror staged on what has in recent years been named “Cliffhanger Point.” This area is pictured below in a House of Hate publicity still. I wish I could say that this exceptionally entertaining serial will someday be available on DVD or perhaps on cable TV. Chances are, though, it won’t be. I’d like to think there will additional screenings at museums or other educational venues, but such exposure is by no means guaranteed or even likely. More’s the pity. Of all the Pearl White footage that exists—and there’s quite a bit, albeit mostly in fragmented form minus original titles or chapter configurations—House of Hate is perhaps the most enjoyable. 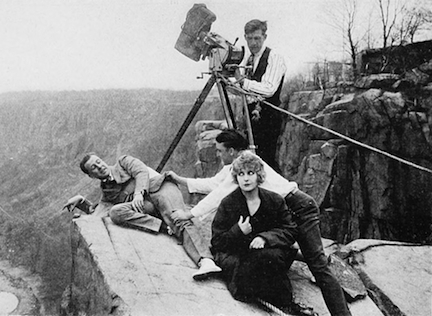 HOUSE OF HATE director George B. Seitz hangs over the edge of “Cliffhanger Point” while Pearl White and Antonio Moreno watch. That’s future Oscar-winning cinematographer Arthur Miller at the camera. Good to know, Tom! I’ll happily plug the screening here, and you can count on me to buy the first ticket! I’d be delighted to see this one again! The Squadron briefly had What was called chapter one posted a few months ago. The chapter ended at a steel mill, with Pearl endangered by a vat of molten steel. Was that really the cliffhanger to chapter one? Yes, that’s where Chapter One really ended. Geez, Ed, spoiler alert! LOL, just kidding. A great article, thanks for sharing. I wish I had the chance to see it. On man, this sounds great! I am an unabashed fan of Pearl White. Perhaps a kickstarter campaign might get this out on a DVD? I would most certainly kick in cash for this! That’s a great idea! I’d definitely donate to a Kickstarter fund for this. What do you think, Ed? Do you have any contacts with those who are showing this serial?